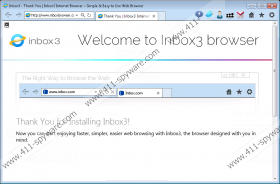 Inbox3 is a browser that looks like Internet Explorer. Even though it resembles this legitimate browser, our specialists claim that you should not trust it. In fact, it would be best to remove Inbox3 the moment you detect it because it is known to be a potentially unwanted application (PUP). One of the reasons why Inbox3 falls into this category is the fact that it starts with Windows automatically. Unfortunately, it is not the only drawback of this browser. In order to find out other reasons why you should delete Inbox3, you should definitely read through this article. If you install Inbox3 or if it slithers onto your computer with the help of other programs, it will immediately make itself your default browser. In other words, all the links will be opened via it. What is more, researchers working at 411-spyware.com have noticed that it will add additional icons to your desktop. Finally, it seems that it is developed by the company that creates advertising-supported applications (adware), which suggest that it cannot be fully trusted. As can be seen, there are many drawbacks associated with Inbox3, so it would be smart to remove it and install another trustworthy browser instead of it. Many users download Inbox3 from its official website inboxbrowser.com; however, it is still very likely that it enters different computers without a direct user's permission. If you cannot remember downloading it, it is very likely that it has used an unfair tactic to enter your system. Our security specialists also recommend scanning the system with the diagnostic scanner because Inbox3 might have entered together with other programs that fall into the category of malicious software. 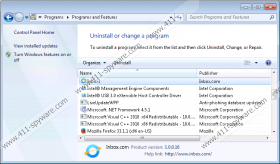 You can try to detect and remove these programs yourself as well; however, it might be very difficult to do that because these programs tend to hide and they often pretend to be useful and legitimate. Luckily, Inbox3 is just a potentially unwanted application, so you will be able to remove it via Control Panel. If you have never tried doing that yourself, you should follow our manual removal instructions (see below) step by step. 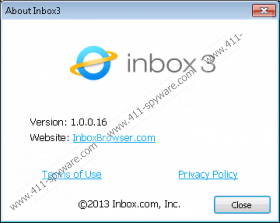 Another way to remove Inbox3 is to scan the system with a trustworthy antimalware tool. If you do not want to get disappointed, you should use SpyHunter or a similar tool for this matter. It has to be emphasized that a trustworthy tool will not allow other suspicious programs to enter your system. The only thing that you will have to do is to enable your security software and keep it up-to-date. Right-click on Inbox3 and then click Uninstall. When the box opens, type in control panel and click OK.